In-clinic professional Teeth whitening is an easy fast and non-invasive cosmetic treatment producing immediate results. The specially formulated gel is used in conjunction with the power advanced laser light accelerator to remove stains that have built up over years, in just 20 minutes! 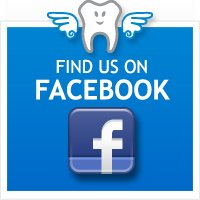 Laser Teeth Whitening has been extensively tested and proven to have no long term negative effects on the enamel, dentine of teeth or the gums. The White House whitening gel (comprising 6% Hydrogen Peroxide) is specially formulated to improve general oral health, by helping to strengthen the teeth and the light accelerator also kills 95% of any harmful bacteria that may be in the teeth and gums. We give a 100% money back guarantee – If we don’t whiten your teeth by a minimum of 5 shades whiter, you will not be charged for the treatment. On the day of your treatment shade measurements will be taken in conjunction with your treatment consent form, we will confirm this shade with you and record it on the form. We aim to achieve a minimum of 5 shades whiter from your starting shade. If you do not acAhieve 5 shades whiter (measured on the international standard Vitapan Shade guide) on the day of your treatment you are entitled to not pay for the treatment or we can offer you additional whitening sessions free of charge to achieve optimum and satisfactory results or a complimentary home kit if that is preferable. Payment of treatment on the day is accepted as customer satisfaction with results. If you have had a second treatment and achieved satisfactory results but afterwards found that your teeth have regressed, please don’t hesitate to contact us again, we will need you to come back to the clinic to verify that the shade has regressed again. At this point we would not recommend further treatment, unfortunately, about 2% of people’s teeth will not hold the whiter shade due to the mineral content and composition of the enamel and dentine of the teeth, therefore further sessions would likely just regress again. Once we have verified and recorded the shade we can offer the full refund. Professional laser Teeth whitening is an easy fast and non invasive cosmetic treatment producing immediate results. 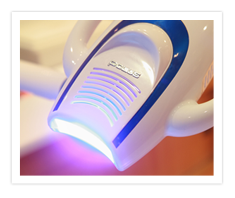 The specially formulated gel is used in conjunction with the Power Advanced laser light accelerator to remove stains that have built up over years, in just 35 minutes! Professional Laser Teeth Whitening has been proven to have no long term negative effects on the enamel, dentin of teeth or the gums. The Beyond teeth whitening gel is specially formulated to improve general oral health, by help strengthening the teeth and the light accelerator also kills 95% of any harmful bacteria that may be in the teeth and gums. You need to understand that the enamel on the outside of the tooth is actually transparent and is porous. Stains that build up on on top of the enammel, around cracks, caps or fillings or between the teeth are called extrensic stains. Extrinsic stains can be removed with a scale and polish at the dentist. Under the transperant enamel is the dentine, over years, molecules of dark staining food, drinks or cigarettes penetrate through the enamel staining the dentine. It’s actually the dentin gives the tooth it’s clour generally leaving them discoloured or yellow looking, depending on eating and drinking habbits. The Beyond tooth whitening system actually removes both types of stains. 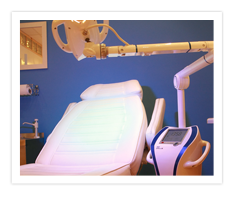 This is done by placing the whitening gel on the teeth and exposing it to the specifically tuned frequency of cold filtered blue light which turns the whitening gel into oxygen. As this happens it allows the whitening gel to penetrate under the enamel to remove the stains from the dentine of the tooth. This restores the teeth back to their natural whiteness leaving them looking healthy, bright and naturally white.